Bavarian Technic can read-out fault code information by communicating with the control unit and requesting fault data programmatically. Responses from the control unit are interpreted by the software and displayed on the screen along with a corresponding description. The fault codes and descriptions are the same as those found in the factory tool and the codes can be referenced in the factory manual as needed. Bavarian Technic can display several types of trouble codes: fault codes, shadow fault codes, and soft fault codes. 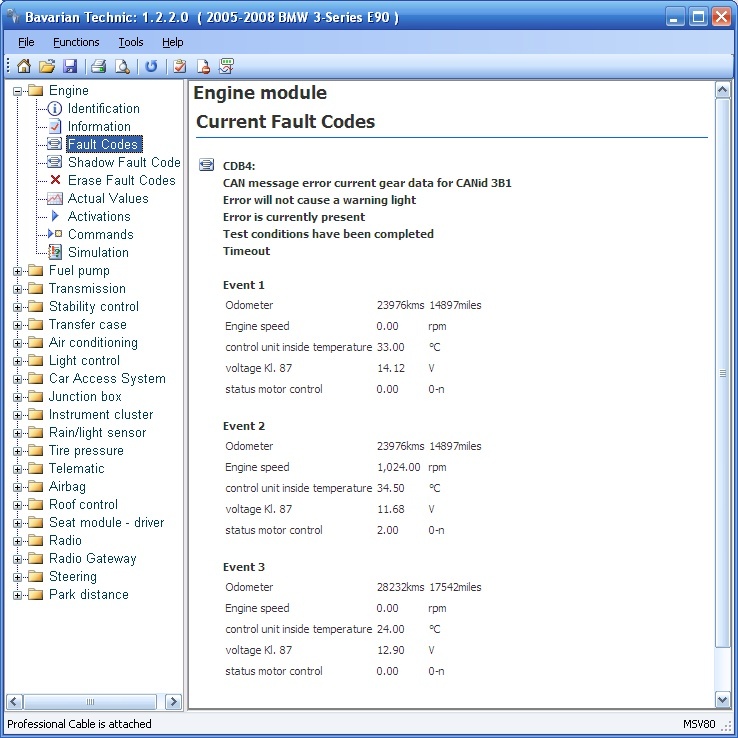 Bavarian Technic shows the fault code and a description of the fault to help you troubleshoot the problem fast. This is different from many other tools that only show the code without a description. For a list of models and control units that support fault codes, check our Model/Feature Matrix. *Not all electronic control units support faults or all fault types. **Workshop information is available in the Professional version only.